Verrant Morass is a grove in central Greenshade, west of Marbruk. Verrant Morass Objective: Discover the source of the blight. 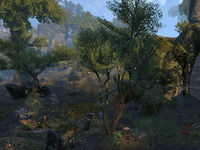 Verrant Morass Wayshrine is located to the west of Verrant Morass, off the road to Hectahame. 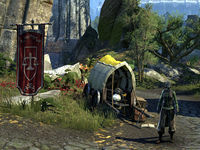 A guild trader cart, Hect-of-a-Sale, operated by Seeks-Better-Deals can be found to the north-northeast of the Wayshrine, on the crossroads.